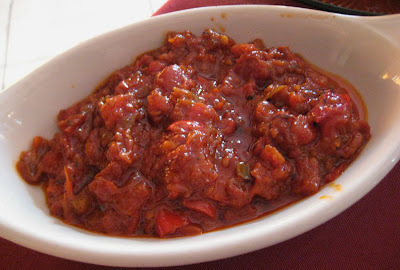 Mr Minx and I were invited, as press, to enjoy a complimentary dinner at the new Moroccan restaurant, Tangier's. As one can probably tell by the name, Tangier's serves North African cuisine; as one can tell by the unnecessary apostrophe, the restaurant is in Baltimore. Located in Canton on the corner of Boston Street and Montford Avenue just south of the Can Company, you can't miss the now nearly neon red building that once housed Red Fish. Inside, the restaurant is painted with warm earth tones and sports a beautiful bar area in the front. We were led to a table in the dining room behind the bar area and told to choose anything we wanted from the relatively short menu of twenty items, all mezze, the Eastern Mediterranean version of tapas. After a bit of discussion and a consultation with our server, we decided on: lentil soup; two of the cold mezze, tchouktchouka and spicy fried eggplant; chicken shish kebab; chicken bastilla; and the "Sabbath meat delight." While waiting for our food, we sipped a pink-colored French Martini, redolent of citrus, and a glass of pineapple-y red sangria. All of the dishes on Tangier's menu come from Casablanca-born owner Alan Suissa's family and are prepared on premises by his mother Nadia and his aunt Liliane. I love the "home-cooking" aspect almost as much as I love the fact that we now have some Moroccan food in Baltimore! Twenty or more years ago I had eaten at Marrakech, in Washington, DC, and I still think about the delicious food, particularly the b'stilla, or chicken pie with almonds. 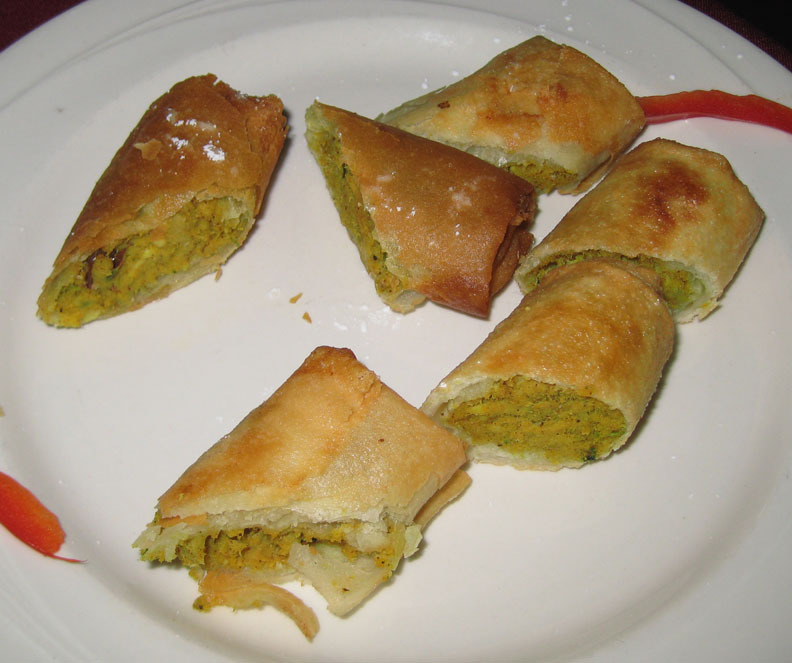 Tangier's calls their version bastilla, and serves it as clever cigar-shaped packages of cinnamon- and almond-scented chicken rolled in the filo-like pastry, ouarka. The tchouktchouka, a thick stew-like mixture of roasted tomatoes and peppers, was a simple and hearty preparation that would have benefited from being served with some crusty French bread. Instead, we got squishy, bland, American rolls. Likewise, the eggplant dish, reminiscent of a favorite Indian dish called bengan bartha, cried out for a better starch on which to slather it. Both of these vegetable dishes tied for my favorite of the evening. They were rich yet subtle, and had just the right amount of oiliness without being unctuous. Both the lentil soup and the Sabbath meat delight reminded Mr Minx and I of our grandmothers' cooking. The lentil soup had a nice proportion of broth to legume (often lentil soup is too porridge-like for me) and had a very homey, warm, subtle spicing. 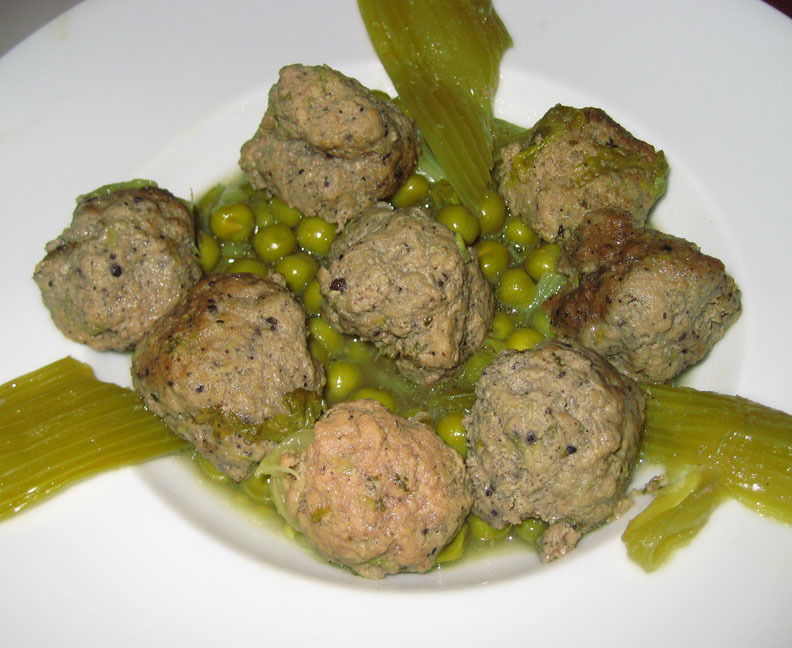 The meat delight, a mound of sliced meatballs served with stewed peas and celery, brought back Grandma's beef soup. I don't even like cooked celery and found myself enjoying the long-forgotten flavor of my childhood. Considering that Mr Minx's family was German, and mine Polish, this whole food memory thing seems a little odd, since clearly the spices used in the cuisines are vastly different. Chalk it up to the home-cookin' vibe of these specific dishes. The last savory dish we tried was the chicken shish kebab. 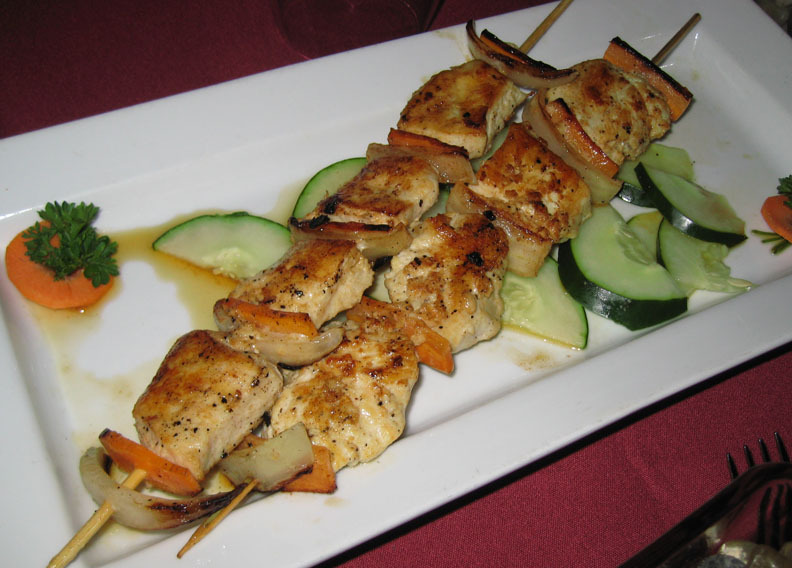 Although flavorful, the chicken breast meat was dry and tough. Thigh meat would be the way to go in this dish. We finished our meal with a plate of assorted Moroccan pastries. Yes, these pastries are impossibly tiny and cute, but they were very sweet and the perfect size to follow all of that food. The flower-shaped, sesame-dusted chebakia had an intense honey flavor. 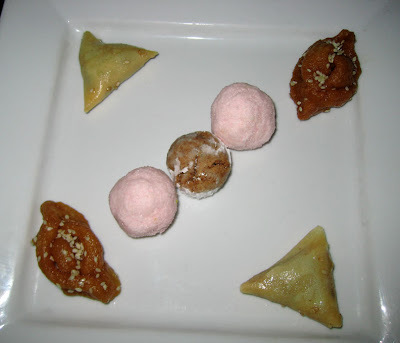 There were also balls of pink zucre coco, a sweetmeat not unlike a coconut fudge, and a tiny triangle similar to baklava, with a nicely caramelized warka crust and a hint of lemon flavor. If you're interested in tasting a bit of North Africa, check out Tangier's. Definitely go for the tchouktchouka and the eggplant. I'm definitely interested in trying out the merguez, the tagines, and the flounder.